I discovered this wild garden some ten years ago at the edge of one of the talus slopes just over the crest of Sapsucker Ridge. I had been bushwhacking along the northwest side, smashed my way through the last laurel tangle expecting to hit open rocks, and found this instead. 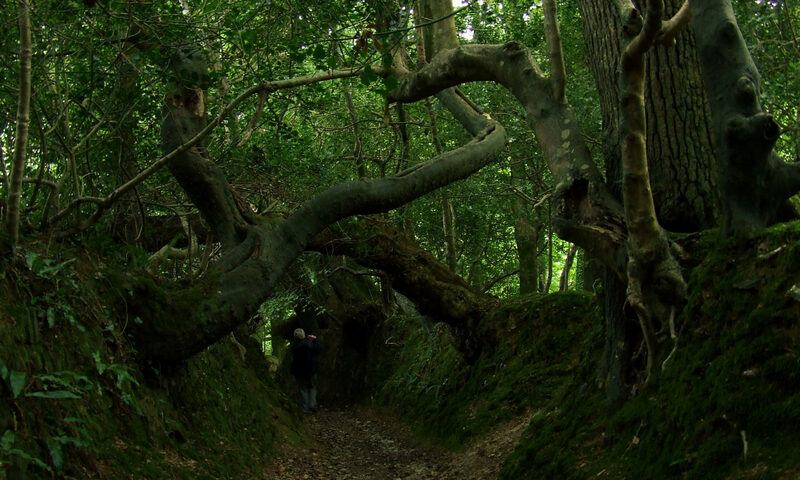 I was immediately reminded of the Moss Temple (Kokedera), a World Heritage Site in Kyoto, Japan that I was fortunate enough to visit back in 1986. Despite constant traffic noise — in this case, from the four-lane highway at the base of the ridge — a moss garden is a summons to silent contemplation. Something about that densely packed green crowd maintaining such utter silence can’t help but have a profound effect on the imagination. As I discovered on that first visit, there’s only one easy way out or in. On subsequent visits, I’ve always approached it thinking I must’ve been mistaken, maybe it’s not that great after all, because the view from above isn’t too promising. You have to pick your way to the bottom of the slope, and even then, I suppose, it might not be everyone’s idea of a scenic spot, especially since the view of the valley and the Allegheny Front beyond is better from an area of open rocks 75 feet away. But the variety of moss and lichen species in such a small space seems extraordinary. One of these years I’ll have to try and photograph them all so I can key them out. There’s a feeling of deep time, almost timelessness, in the slow-growing moss and lichens. They grow on their own calendars, flourishing at times of the year when nothing else is green. At the end of the last glacial epoch 8000 years ago, this ridgetop, like every other in central Pennsylvania, would’ve been a cracked and broken scree slope — a biological desert. We’re well south of the furthest extension of the ice sheet, but miniature local glaciers still did plenty of damage. Eight millennia later, patches of open talus still remained when these ridges were clearcut for charcoal in the early 19th century, and the subsequent fires and erosion enlarged them again. In the two centuries since, the forest has resumed its glacially slow conquest of the rocks. I can never go there without doing some damage, no matter how gingerly I step, so I try to limit my visits to just once a year. The moss grows directly on the rocks, which shift unpredictably under my weight, tearing their thick green pelt. If I step on the unmossed rocks, the foliose lichens crumble under my boots. How can something so tough be so fragile? Once, I discovered a neat line of deer hoof prints through the moss — a rarity, since the deer usually avoid the leg-breaking talus. Three years ago, a large branch fell across the upper portion of the garden, and now it shelters a foot-wide band of fallen leaves and leaf-rot. This, of course, is how the forest spreads. Should I put my finger on the clock-hand and keep this area in a state of arrested development — as the monks at Kokedera have been doing for the last 700 years with their obsessive raking and removal of all organic debris? Should I start picking out the branches and pulling the occasional blueberry, striped maple, and black birch sprouts? Should I, in short, become a gardener, and rob this spot of its wildness? Or should I let nature follow its course, content in the knowledge that plenty of other potential “found gardens” exist, slowly shifting in and out of peak aesthetic condition, all over the mountain? View the complete slide show or photo set. What a nice piece. I think you’ve long since decided to let it be. In practical terms, you couldn’t visit often enough to curate it. In any event, the forest is ready to teach you another lesson about how it evolves. Enjoy the show, and thanks for sharing it. In practical terms, you couldn’t visit often enough to curate it. Perhaps so, but remember, our growing seasons are pretty short compared to Florida’s, and this is a very infretile spot, to put it mildly. A once-a-year weeding and pick-up might well be all that’s needed to maintain it. But you’re right, I’ve pretty much alrady made up my mind to keep it wild. Beautiful post. In all ways. I imagine you look forward to your annual visit. Moss is devilishly hard to transplant, but quite by accident I’ve got a couple small colonies of it going indoors in the pots for other houseplants. It makes an especially nice groundcover for my jade plant. Fungi are their own kingdom now — one of either five or seven kingdoms, depending on who you talk to — so yeah, it’s correct to say that a lichen is a partnership between a fungus and a plant, or between a fungus and a cyanobacterium (classed either in Monera or in Bacteria). How wonderful, like a secret garden! Reminds me of childhood discoveries in the damp shady spots in the woods in Manitoba while out picking wild blueberries. Of course, moss is everywhere here in Vancouver, in our lawns, on rocks and northern sides of trees, sometimes turning brown in the heat of summer but always returning to that brilliant green when the rains return. Then there’s all the hanging moss in the trees on the west coast of Vancouver Island. Love it! That’s true, temperate rainforests are ground zero for mosses, aren’t they? Did you see my mom’s latest column? I was really pleased with the lead photo we found on Flickr to illustrate it, of a moss-covered phone booth in the Olympic Peninsula. I really enjoyed the few days we spent there and on Vancouver Island when I was a kid. What an amazing ecosystem! I forgot to mention that at first I thought those were interesting rocks in the third photo, then realized those are very odd lichens on rock. Fantastic photos, Dave. Thanks. That’s called rock tripe, Umbilicaria, and apparently it yields a very good natural dye, the famous orchil purple of northern Europe. When my hiking buddy L. and I go to places with lots of it, we look for broken ones in the leaf litter to collect. You can sometimes find it lying at the base of small cliffs, for example. She dyes wool with it. Have you read Robin Wall Kimmerer’s book Gathering Moss? Thanks. Yes, I have read that book, but it’s been a few years. I’m probably about due for a re-read. Great pics and nice post. I think nowadays, it can be tough to find something like this close to many four lane highways. Cheers. Well, you’d be surprised. Unfortunately, Pennsylvania has a greater density of highways than almost any other state, and many of them cut through some pretty unique habitats — bogs, fens, barrens, you name it. Beautiful. Thanks for bringing the quiet green out of the forest. I’m thinking to let it evolve and enjoy the process. Life is change. Yep, that’s what I’m thinking, too. Thanks for commenting. I love moss gardens–love yours. Splendid gardenish post that soon will be tucked away in secret. You mean, as it vanishes into the archives? true. But I could tag it as a favorite post so it would show up in the “Best of Via Negativa” section of the sidebar from time to time. Glad you’re back. I think a good vacation is exhausting in the way that a good massage can be exhausting, no? It has been exhausting, more than I realized it would be. Jet lag is not so bad going out but returning over twelve zones after 15 days of going all day every day seems to be a bit too much, for me at least. Lovely pics — and I applaud your decision to let it be. Such little spots of magic are naturally bounded, not only in space, but in time as well. BTM, lichens similar to your “rock tripe” are everywhere that I’ve been hiking in the Shenandoah area. It looks like the mountains have eczema. ;-) I’m pretty sure the rocks are providing them with not only a surface, but trace minerals as well. That’s true. It’s not an uncommon lichen — and in fact is found in northern Europe as well. Nice post, and photos. I love moss. More moss! “Long ago the advance guard of vegetation came to a halt on the rocks, which were dumbfounded. A thousand silken velvet rods sat down cross-legged.